“Founder’s Mutation” is undoubtedly a step up from the premiere, effectively utilizing the “monster of the week” setup that it perfected way back in the ’90s. Old X-Files scribe James Wong imbues the episode with a continuous undercurrent of tension, kicking off the episode with a creepy opening and including quite a bit of unsettling imagery throughout the remainder of the hour. Even if the episode has its problems, it at least has some momentum going for it; also, it has a story structure that doesn’t attempt to do too much, that doesn’t try to be anything other than the entertaining sci-fi show it is. By zeroing in on the “monster of the week”, Wong and co build the foundation for the exploration of the show’s two main characters. Specifically, this is in reference to the William storyline, one that is undeniably soapy but sold beautifully by Duchovny and Anderson. It’s clear that Scully and Mulder are still grappling with the idea of giving William up, and the dream sequence/fake flashback scenes are surprisingly effective and moving. The parallels between the MOTW storyline and William are numerous, and it’s made even more explicit at the end when William is abducted in the same manner that Mulder’s sister was. And as the camera moves back from Mulder at the desk, we feel the weight of the entire storyline on his shoulders, the past, present, and imagined converging in one powerful image. 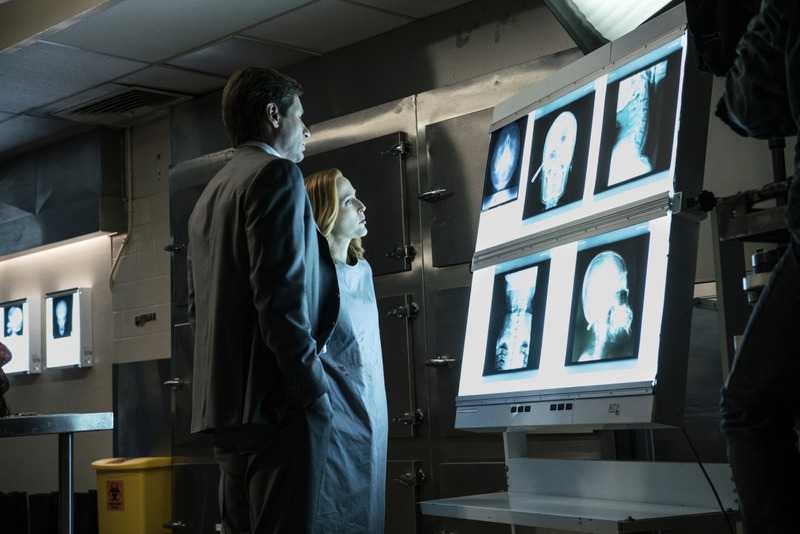 – “The truth is in there.” Ah, there’s that X-Files humor that was lacking in the premiere! I look forward to even more during next week’s Darin Morgan-penned episode. -Some nice guest appearances in this one: Battlestar Galactica’s Aaron Douglas, Chuck‘s Vik Sahay, and Hannibal‘s Kacey Rohl. -Fantastic makeup work for the kids in the hospital. I am so glad The X-Files is back, albeit for six episodes only. I loved this episode better than the pilot. The chemistry beweet Scully and Mulder and their kid plot were great. Can’t wait to see what this season will concludes!